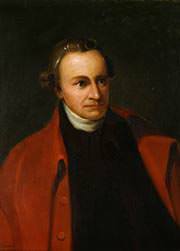 Patrick Henry was one of the primary persons responsible for initiating the American Revolution. He was one of the greatest orators and his words: “Give me Liberty, or give me Death!” have become legendary. Born on May 29, 1736, in Hanover County, Virginia, Henry had an eventful life, laden with many accomplishments. Here are ten interesting facts about him. At the age of 15 Patrick started running a store for his father but the business was unsuccessful. He married at the age of 18 and received six slaves and 300 acres (1.2 kilometers square) as dowry. For three years Patrick tried growing tobacco on the land but failed in that venture too. After the farmhouse was lost to a fire in 1757, Henry managed a tavern of his father-in-law and studied law. In 1760, he qualified as a lawyer. In 1758, after three years of drought which resulted in the low yield of tobacco crop, the Virginia Assembly enacted the Two Penny Act. It fixed Anglican Church ministers’ salaries at two cents per pound of tobacco despite the market rate varying between four and six. 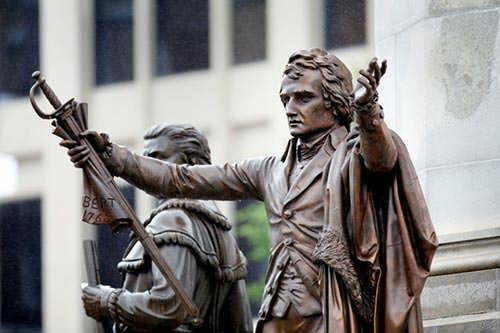 A clergyman named James Maury sued Hanover County for damages and Patrick Henry defended Hanover County against Maury’s claims in a case known as the “Parson’s Cause”. Henry was effectively representing the American cause in the case. He argued for the Two Penny Act and compared the King of Britain, who had vetoed the law, to a tyrant. He convinced the jury to grant the lowest possible award, i.e. one penny. The 1763 case developed Henry’s reputation as a powerful and persuasive speaker. 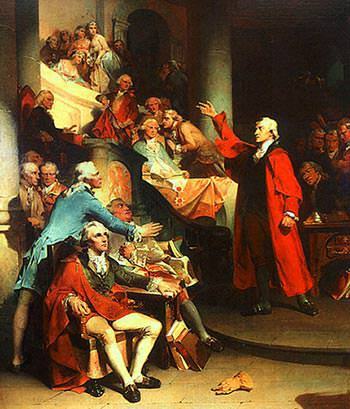 “Parson’s Cause” is viewed as an important event leading to the American Revolution. 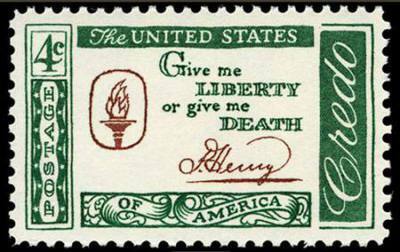 In 1765, Britain imposed a tax on its colonies in America via the Stamp Act. The same year Henry was elected to the House of Burgesses, the legislative body of the Virginia colony. 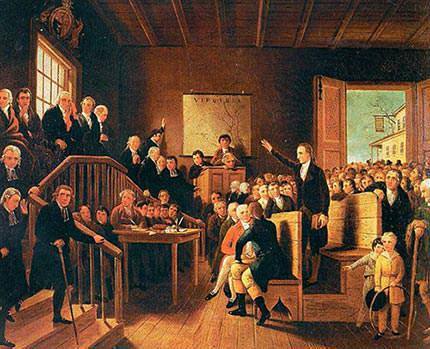 Nine days after being sworn in Henry introduced the Virginia Stamp Act Resolutions. The resolves claimed that in according to British law, Virginia was subject to taxation only by a parliamentary assembly to which Virginians themselves elected representatives. 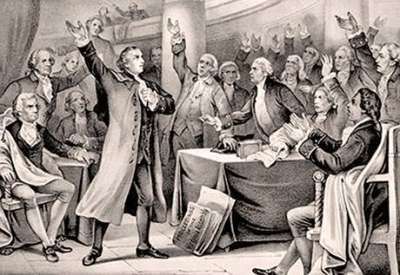 While introducing the Resolutions, Henry used such extreme language that some Virginians said it smacked of treason. It is debated by historians whether he used the words: “If this be treason, make the most of it!” Whatever be the case, his speech was radical enough to gain attention at the time and has now become one of his most famous speeches. After much debate and opposition, Henry managed to get the Virginia Resolves passed by the Virginia House of Burgesses. It was probably the most anti-British political action taken till that date. The resolves began the opposition to the Stamp Act that would contribute to the American Revolution. In 1776, Henry was elected by the new state legislature as the first post-colonial Governor of Virginia, for a one-year term. He was twice re-elected, serving until 1779. In 1784, Henry was again elected as Governor of Virginia and served till 1786 as he was re-elected twice. Post-revolution Henry feared that a strong national government was a threat to individual rights and that the President would become a king. He was a critic of US Constitution and was instrumental in having the Bill of Rights adopted to guarantee individual rights like freedom of religion, freedom of speech, a free press, etc. In 1754, Henry married Sarah Shelton. He had six children with her. Unfortunately, Sarah became mentally ill and died in 1775. In 1777, Henry married again at the age of 41 to the 22-year-old Dorothea Dandridge. The couple had eleven children. Henry died of stomach cancer on June 6, 1799. He has been honored multiple times on US postage stamps. Several places and a variety of ships, schools and other institutions have been named after him.